The Virgin Racing Formula E team backed by Sir Richard Branson, and the DS Brand, represented by CEO, Yves Bonnefont, have announced a new partnership and the creation of the DS Virgin Racing team taking effect ahead of the 2015/16 FIA Formula E season. The new partnership will see the DS brand, through its Motorsport Division, bring its technological expertise in research and development of the race car, together with the design strategy of Virgin Racing Engineering. The aim is to deliver the infrastructure, racing experience and design and integration expertise to compete at the highest levels and to win Championships. "Our collaboration with the DS brand is not only a partnership between two amazing brands, but is a great opportunity to showcase our intent of winning FIA Formula E championships. In addition, it highlights our ambitions to be at the forefront of pioneering new technology in Formula E to aid the technology transition to road cars," said Alex Tai, Virgin Racing Team Principal. Founder of Virgin Group, Sir Richard Branson, added, "I'm absolutely delighted that Virgin Racing has found a partner of the calibre of the DS brand. In Season 1, Formula E has delivered on its vision of creating exciting, fan-friendly racing spectacles where almost any team can win; now I look forward to building on this in Season 2 and with our new partner DS, aiming to compete to win multiple Championships. 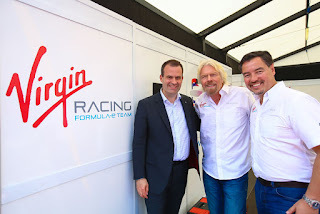 I'm thrilled that Virgin Racing is playing a leading role in another of Formula E's visions, that of attracting the large automotive OEMs into the sport in order that the technology that is developed flows down into the cars that we can all drive. I have no doubt the partnership will prove a great success, not only on track but also in providing a catalyst to develop the electric vehicles of the future." "The engagement of the DS brand in Formula E with our partner Virgin Racing is fully consistent with the brand's positioning. We fully share the values of Formula E: avant-garde technology and proximity to the public. The experiences that we will accumulate thanks to the races are key factors for us in the improvement of our technology directly serving our customers," said Yves Bonnefont.